Brazilian Jiu Jitsu, as the name implies, originated in Brazil. ”BJJ” emphasises ground fighting, and is considered to be a martial art, combat sport and self defence method. With a heritage in jujutsu, the art promotes the concept of a smaller and weaker person defending him or herself from a larger one by using technique and leverage. It requires great focus in order to learn how to overcome the opponent through the use of joint-locks and choke-holds. Training a martial art is one of the most beneficial things you can do, both mentally and physically. Brazilian Jiu Jitsu, however, is more than this. It’s a way of life, because it promotes not only physical activity, but also improvements to your character: simply put, it can make you into a better person. Technique is the only proof in Brazilian Jiu Jitsu. You do not need any natural talent to succeed at BJJ; hard work and perseverance are the only qualities required to climb to the top. Brazilian Jiu Jitsu develops the confidence to accomplish your goals in life. No other sport puts you in positions where – at full speed – you have to overcome size and strength disadvantages, keep cool under stress, and face your fears of confrontation and physical damage. People who begin BJJ often have the intention of training no more than a couple of times a week but there is so much to learn and it’s so much fun that it truly does become a lifestyle choice, with positive consequences for health, weight-loss and overall conditioning. We’ve welcomed many BJJ superstars through our door in recent times. To name but a few: Marcus “Buchecha” Almeida, Leo Vieira, Lucas Leite, Roberto “Cyborg” Abreu, Rafael Mendes, Cobrinha Charles, Roger Gracie, Renzo Gracie. Stay tuned to #TNDNews for the latest updates on all our special guests! The first BJJ trial class should be booked in advance: please contact us today to reserve a place! Otherwise, for gi classes it’s gi/kimono and belt, and for no-gi, rashguard and board shorts. A mouthguard is advisable also for sparring. For your first trial class a rental gi is available: Book today! All ages welcome, from age five to retired: you’re never too old! Good hygiene: Ensure your fingers and toes are well-groomed. If you have long hair, put it up in a ponytail or bun. You should also remove any piercings and jewellery to prevent injury. Why should I start this discipline? Become a true warrior. Compete in tournaments. Build lasting friendships. Increase your confidence and self-discipline. Learn humility, respect, and how to master the ego. 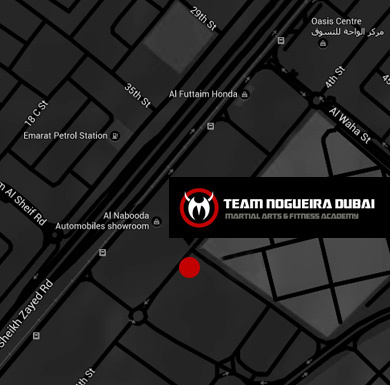 With a league of extraordinary coaches and star guests, Team Nogueira Dubai offers you the very best of BJJ in the UAE. Join us: the possibilities are endless! Share the Journey – It’s more fun with a friend! 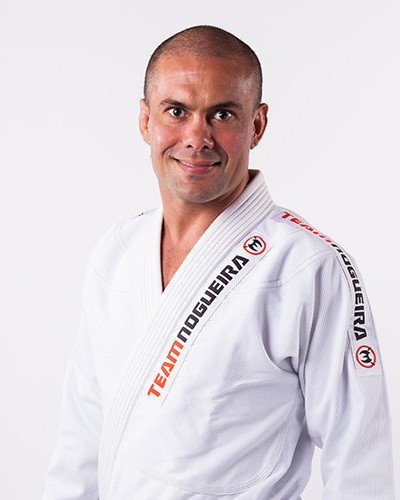 Rafael is the Managing Director of Team Nogueira Dubai and head coach of the Brazilian Jiu Jitsu programme. Rafael founded TND in 2013 and is widely known in the BJJ community, having won the World Cup in 2002, 2003, as well as medals in European No-Gi, Pan Ams, Abu Dhabi Worlds and the Abu Dhabi Grand Slam. With more than twenty five years’ experience in the fight industry, Rafael is a world-class instructor and competitor, a two-time World Champion and European Champion. He currently holds a fourth degree black belt in Brazilian Jiu Jitsu, which he received from the legendary Ze Mario Sperry. 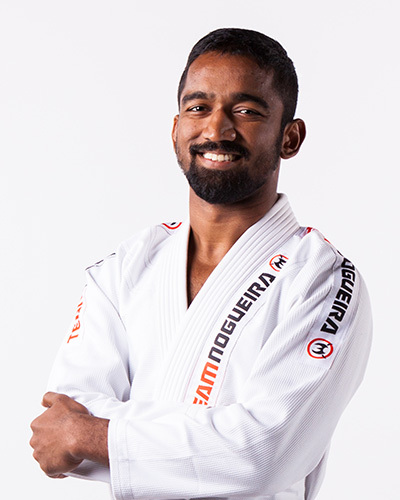 Rafael started training jiu-jitsu when he was only 15 years old, at a time when BJJ was exploding in Brazil and becoming a popular national sport. Rafael had always been a sports fanatic, from surfing to judo to football; he did everything and that lead him to take on BJJ as well. When he was 18, Rafael started to get sponsors and train jiu-jitsu professionally. “It became a lifestyle and took up all my time,” he says, adding that he was “eating and sleeping jiu-jitsu.” Rafael is widely known in the BJJ community and has won various different medals and titles, including the World Cup as a purple belt in 2002 and in 2003 as a brown belt in the adult division. He has also won several medals in competitions such as the European No-Gi, and achieved second place in the Pan Ams, second place in the Worlds in Abu Dhabi and recently brought home a gold medal from the Abu Dhabi Grand Slam. Retiring from international competition, in 2013 Rafael founded Team Nogueira Dubai, investing it with the same energy and passion that he puts into the mats. He has trained with the Nogueira brothers, Minotauro and Minotouro, for two decades and developed a friendship with the fighters. With the support and involvement of Sheikh Tarik, to whom he introduced the Nogueira brothers, he was able to bring this internationally recognised brand to the UAE. “I want to teach everything I know with discipline and respect,” says Rafael about sharing his knowledge with his students. He believes that the most important thing one must do is take care of their body and tries to pass that on to his students. Ricky is a BJJ coach at Team Noguiera Dubai, and with eight years of experience, he holds a strong belief that everyone has the ability to excel at this martial art, as long as they are patient, persistent and hard working. A winner of numerous tournaments, he currently holds the rank of brown belt under Rafael Haubert. Ricky has been practicing BJJ for eight long years, and it all started when he was still in high school. He had been a big fan of MMA and was especially fascinated by the ground fighting, so when his friends told him about a BJJ gym, he naturally headed there and the rest, as they say, is history. He has always been a dedicated student of the martial art and trained extremely hard over the years, but it was in 2014 that he decided to turn his passion into a full time job. “I love to pass on my knowledge to my students and spread the love of the martial art. I make sure that new students feel comfortable with what they are doing and understand all the basics,” says Ricky about his coaching method. Max is the youngest coach in Team Nogueira Dubai, and has been practicing jiu-jitsu for the past five years. He is a World No-Gi medalist, a Pan-American bronze medalist, European bronze medalist and multiple-time UAE Jiu-Jitsu Champion. 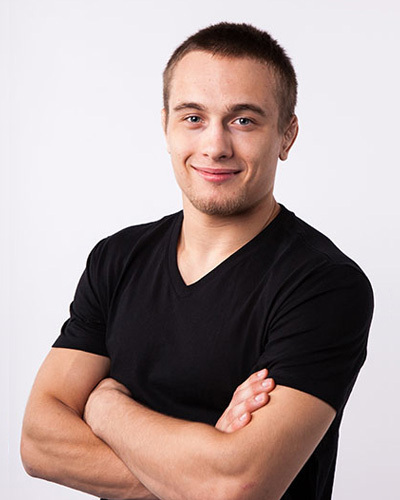 Max considers himself to be not only a coach, but also a student of BJJ. Max trained gymnastics, then muay thai, and then finally decided to try an intro BJJ class and fell in love with the martial art. He has never stopped training since then. After only a year and a half on the mats, Max started competing and winning various competitions, both nationally and internationally. This led him to train even harder and he soon decided to make the sport his career. He loves both training and teaching, and as an instructor he teaches in as broad a manner as possible, without emphasising any one style. Copyright 2017 Team Nogueira Dubai | All Rights Reserved.